"And I don't even have to deal with this crap anymore!" 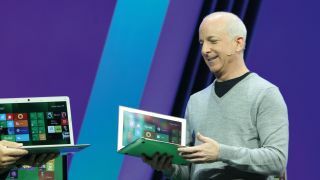 After his sudden departure from Microsoft back in November 2012, Steven Sinofsky was banned from defecting to the company's rivals for at least a year. Microsoft has been through it's burn book and decided that the ex-Windows man can't work for Apple, Amazon, Facebook, Google, Oracle and VMWare before 2014. He's also been given a list of BFF companies that he's not allowed to try and convince to stop being pals with Microsoft including IBM, Dell, Intel and Nokia. Still, we're sure Sinofsky will be okay - the Guardian has done the math and reckons his payoff is worth over $10 million (£6.6m / AU$11m). Lend us a fiver, Steve? What else is worth over $10 million? TechRadar's news blips, probably.